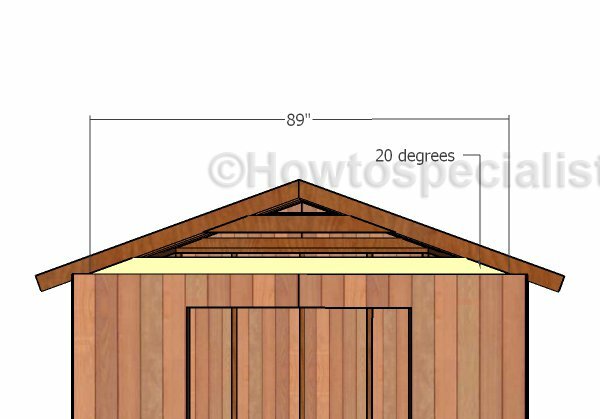 This step by step woodworking project is about free 8×8 garden shed roof plans. This is PART 2 of the garden shed project, where I show you how to build the rafters and how to install them into place properly. In addition, the access to the interior of the shed is easy, as you have double doors to the front of the shed. See my other DIY projects HERE. The first step of the project is to build the rafters for the garden shed. As you can see in the plans, you need to mark the cut lines on the slats and get the job done with a saw. Smooth the edges with sandpaper and repeat the process for the rest of the project. Lay the rafters on a level surface. 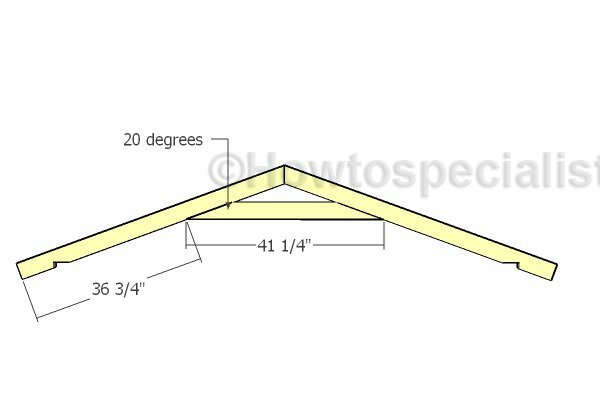 Build the bottom rafters from 2×4 lumber, as well. Cut both ends of the bottom rafters at 20 degrees, using a good miter saw. Attach the 1/2″ plywood gussets to the joints, so you enhance the rigidity of the trusses. Drill pilot holes and insert 1 5/8″ screws to lock the components together tightly. 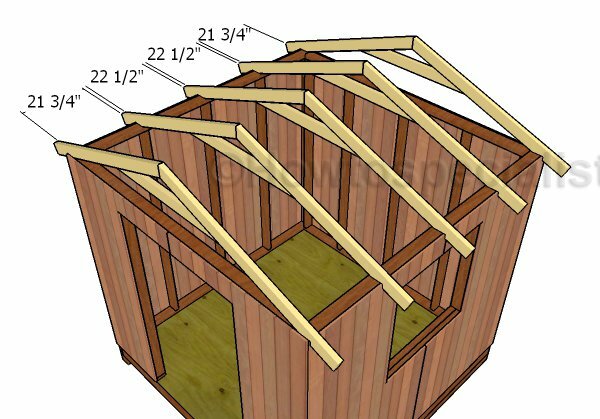 Fit the trusses to the top of the garden shed, Place the trusses equally spaced, every 24″ on center. Use a spirit level to plumb the trusses and then lock them into place with rafters ties. Fit 2×4 supports to the gable ends of the shed. Toe nail the supports to the trusses. Use T1-11 siding to the gable ends of the garden shed. Mark the cut lines on the sheets and then get the job done with a saw. Align the edges with attention and then lock panels into place with 6-8d nails. Cut the sheets for the roof from 3/4″ plywood. Fit the sheets to the top of the rafters, align the edges flush and secure them into place with 1 5/8″ screws. Insert the screws every 8″, along the rafters. Fit 1×4 trims to the end of the rafters. Use 6d nails to lock the trims into place tightly. You could fit asphalt shingles to protect the shed, as it is a straight forward solution. Therefore, install roofing felt over the roofing sheets, making sure the strips overlap at least 2″. Secure the tar paper to the plywood sheets with roofing staples. Fit the side drip edges over the roofing felt, while the bottom drip edges should be fit under. Place a starting course at the bottom of the roof, before installing the asphalt shingles. Always read the manufacturing instructions before starting the installation, as there are several aspects that differ. Smart Tip: The first course should star with a 3 tab shingle, the second course with a 2 1/2 tab , the third course with a 2 tab, the forth course with a 1 1/2 tab, the fifth course with a 1 tab, the sixth course with a 1/2 tab. Repeat the process from the beginning, starting with the seventh course. Don’t forget that the shingles should overhang from the drip edge about a 1/4″. In addition, secure the asphalt shingles to the roof decking with tacks. If you want to build the frame for this 8×8 garden shed, you should check out PART 1 of the project. Check out PART 3 of the project, if you want to learn how to build the double doors and the side window trims. If you like my project, don’t forget to SHARE it on Facebook and Pinterest. 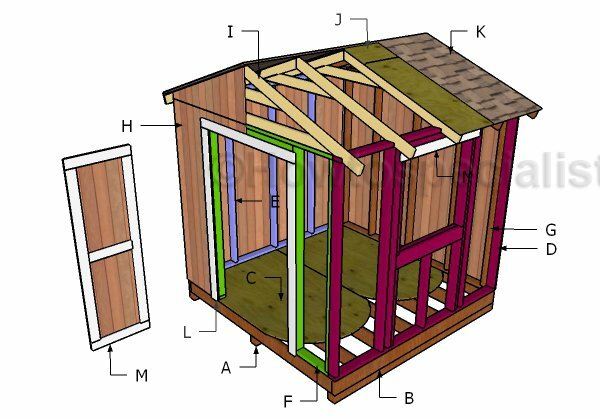 Thank you for reading our project about free 8×8 garden shed roof plans and I recommend you to check out the rest of the projects. Don’t forget to LIKE and SHARE our projects with your friends, by using the social media widgets. SUBSCRIBE to be the first that gets our latest projects.